Garden City, N.Y. – On Monday, May 19, 2014, NASA engineer Kobie Boykins joined over 500 students participated to celebrate Mars at the Cradle of Aviation Museum. Students’ explored microgravity, made their own craters, learned about programming robots, maneuvered through obstacles with a model Mars rover, and more! Each session encouraged participants to learn about the Red Planet and inspired them to explore beyond our atmosphere! Students from Hempstead, Roosevelt, Freeport, Westbury, St. Martin de Porres in Uniondale, and St. Thomas the Apostle in West Hempstead partook in these exciting interactive throughout the morning. Jennifer Baxmeyer, Deputy Director stated, “This event got students jazzed up about STEM by showing them real world projects and problems in our space program. 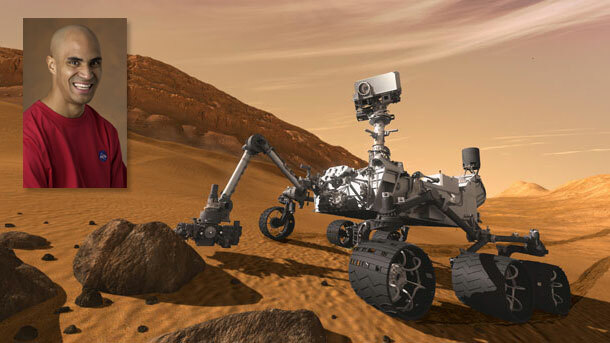 Some of NASA's most ambitious missions to date have been the Mars robotic spacecraft called rovers that explore the surface of Mars. Each trying to investigate whether life could exist on the Red Planet and even help scientists and engineers plan for future human space exploration missions. Unraveling the story of Mars is not just about unlocking its past; it’s about improving life on Earth and discovering the possibilities of our universe.” Students grew to understand the science behind the Mars rovers while they acted as programmers, tested telescope lenses, and learned how vital skills in S.T.E.M. (Science, Technology, Engineering, and Math) will be for the sustainability of NASA’s space exploration programs in the future. In addition to Martian activities, students at the museum, as well as participants via video conference from Cohen’s Children Hospital and the Henry Viscardi School, had the opportunity to hear from one of NASA’s Jet Propulsion Laboratory (JPL) mechanical engineers, Kobie Boykins. He is an integral member of the Mars exploration team at JPL. Boykins’ experience at NASA includes work on all the Mars rovers from solar arrays to actuators. Kobie Boykins speaks with students across the United States about his love for science and what it has been like helping people explore Mars through the Rovers.